Our certified organic chickens and pigs are treated with great care. All of the animals at Riverdog Farm are pasture-raised, which means that they live on a mix of organically grown alfalfa, clovers and perennial grasses as well as forage for insects and nuts. We do not give our animals antibiotics or growth hormones. We believe that the best way to take care of their health is by providing a healthy diet and room to roam. All of our animals are Certified Organic by the CCOF and the USDA. Our meat is processed in a facility that is not certified organic, therefor the meat itself is not certified organic. Our laying hens are rotated through 5-acre pasture swaths. The hen houses are mobile and moved every two weeks to a fresh section of pasture. In addition to pasture and insect foraging, the laying hens are fed our organically grown triticale and safflower, Cowgirl Creamery whey, the farm's veggie and fruit culls, and organic feed. We raise Araucana, Vega Brown, Rhode Island Red, Red and White Leghorn, and Barred Rock laying hens. The variety of breeds in our flock lay eggs that are several shades of brown, white, and even blue. Their yolks are known for their rich color and flavor. Check out an article written about our eggs in The New Yorker! Washed and ready to go! 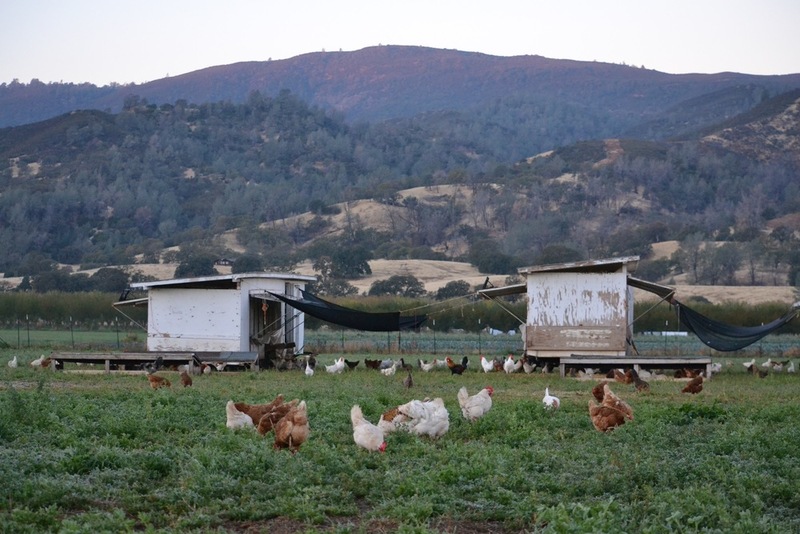 Our broiler chickens, or meat birds, are raised in mobile coops on pasture under our fruit and nut orchards. Each coop is moved everyday to a new patch of fresh pasture. In addition to pasture the meat birds also enjoy a diet of whey-soaked organic grain, veggie and fruit culls, and organic feed from Bar Ale. Please visit our web-store for photos and detailed descriptions of all available pastured meats. Our pigs live on 50 acres of organic pasture and have an all-organic diet that consists of the farm's delicious produce leftovers, Cowgirl Creamery whey, Three Twins Ice Cream, foraged black walnuts, acorns, and grasses, farm-grown grains, and organic feed—all of which contributes to happy pigs and amazingly flavorful meat. We raise Tamworth, Duroc, Hampshire, Chester, and European Wild Boar breeds. The piglets are weaned at 8 weeks (compared to industrial meat production where piglets are weaned at 2 weeks) to help promote healthy immune systems and to allow for ample bonding time between mother and piglet. All pigs have free-range access to pasture and wallows. They are rotated through the 50 acres to prevent manure build-up and soil erosion. Black Walnut and Oak trees provide both shade and tasty snacks. In the winter we provide the piglets with access to heated spaces. Please visit our web-store for photos and detailed descriptions of all available cuts. Newborn Piglets enjoying mom's milk!